Beginning today, San Leandro Police Officers and professional staff members assigned to field operations will be equipped with new technology - portable video camera devices worn on the front of their uniform shirts. They will be used to record interactions with people that they come into contact with during their daily duties. The Police Department began research into this equipment a few years ago, and has since tested and evaluated several different makes and models of the digital recording devices, while writing policy for its employees. Their research has led them to the purchase of the Axon model, manufactured by Taser International. The cameras will be worn by officers for a variety of reasons, but most importantly, to continue to build trust with those that they serve. 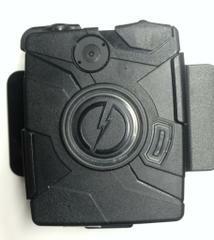 Body cameras worn by law enforcement officers have become an industry standard in many agencies. 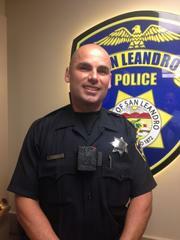 San Leandro is one of the first to use the Axon model made by Taser International and uniformed personnel are mandated to wear the cameras while on duty. The cameras will be used to record interactions with people that officers come into contact with in an official capacity. These recordings will be used to document interviews of victims and witnesses during investigations, obtaining accurate accounts of what is reported to them. In criminal cases, the recordings will be considered evidence, and may be used during court cases. The digital recordings will be downloaded to a secure storage server and retained for future reference. Recordings related to criminal investigations will be retained for one year, and all other routine files will be retained for 90 days. Each recording has an audit trail, and officers are prevented from editing or deleting recordings. This technology also captures an officer’s field of view during incidents, which will be used to substantiate their observations during arrests and other public interactions. Supervisors will have the ability to review recordings during audits of their personnel to ensure continued professionalism, adherence to Departmental policies, and for training purposes. “We value our community’s trust and know the importance of transparency in the work that we do. Our research has shown that this program will reduce frivolous complaints against officers and will reduce staff time used to investigate them,” said Lt. Mike Sobek. Please contact the San Leandro Police Department’s Criminal Investigation Division with any information regarding this case or any other case at (510) 577-3230. For crime prevention tips please go to the Police Department’s website at http://www.sanleandro.org/depts/pd or contact our Crime Prevention Unit at 510-577-3228. Citizens play a critical role in creating a safe environment by observing and reporting any suspicious and criminal activity to the Police. The San Leandro Police Department recommends that citizens do not participate in any direct verbal or physical involvement with suspicious persons or those who are committing crimes. The personal safety of the community is paramount. We encourage the San Leandro community to record the details of what they observe and to report those details to the Police. This type of community involvement and partnership has proven to be a very effective crime prevention tool. Citizens act as the eyes and ears of the community first, and the extended eyes and ears of the San Leandro Police Department. Thank you for being a force multiplier in our efforts to provide professional police services and safety to the community.